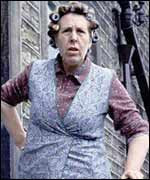 Having a VERY BAD HAIR day!!!!!! I'll be back when I'm feeling less like Norah! There's a battle going on in this house at the moment! It involves the cushions on the sofa. I have a certain way I like to place them and every night before we go to bed I plump them all up so they look nice in the morning. I know, I know it's very sad but it's one of my "things" - I also can't leave the house unless all the beds are made, maybe I need to get therapy or perhaps a life?? 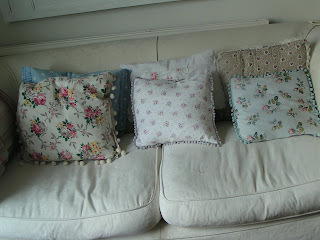 Because the floral one on the left has been claimed as her cushion it just has to go on her side of the sofa, but it doesn't look right! So we are having a very quiet battle, every time I go into the living room the cushion fairy has visited and the cushion has moved so I put it back, and so it goes on. Pathetic and a complete waste of time to some people I'm sure, but it's what goes on in this house, and she's only 2, what have I created?? 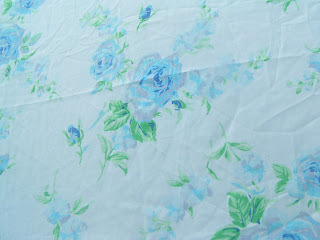 Visited a couple of charity shops recently and picked up this lovely sheet, it's too small for our bed, and I can't bring myself to cut it up so I think it will become a tablecloth for our garden table. I hung it out on the line in the glimpse of sunshine we had yesterday and had that great "washing on the line" feeling, can't explain that one but hopefully you know what I mean! 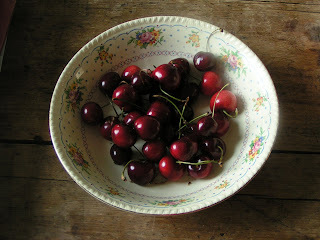 Finally, I treated myself to some cherries yesterday, how expensive are they? £2.37 for this little lot, but boy were they worth it! There's no better taste in summer, although I always think the spitting out of the stones somewhat spoils the moment! This photo captures the true essence of him, he's a great dad (although I don't tell him enough), patient, understanding and always there for his children. They love him to bits and the feeling is mutual. Ian, we love you and always will. 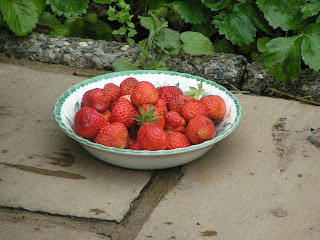 So, the weekend was spent picking strawberries from Pop's veg plot, and then eating them with meringues and cream, YUM! On Saturday we went on a tiny ferry from Knott End to Fleetwood and then caught a tram down to Cleveley's. We had a fantastic time, the children loved being with their grandparents and as an added bonus my grandmother came with us too! Four generations of the same family on a Knott End ferry, bet that doesn't happen often! Thought I'd end this post with a couple of kitchen shots for all those of you like me who like photos of other peoples' houses. 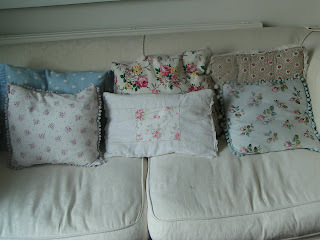 I'm going to have to start sewing again soon to have some more interesting bits to show! 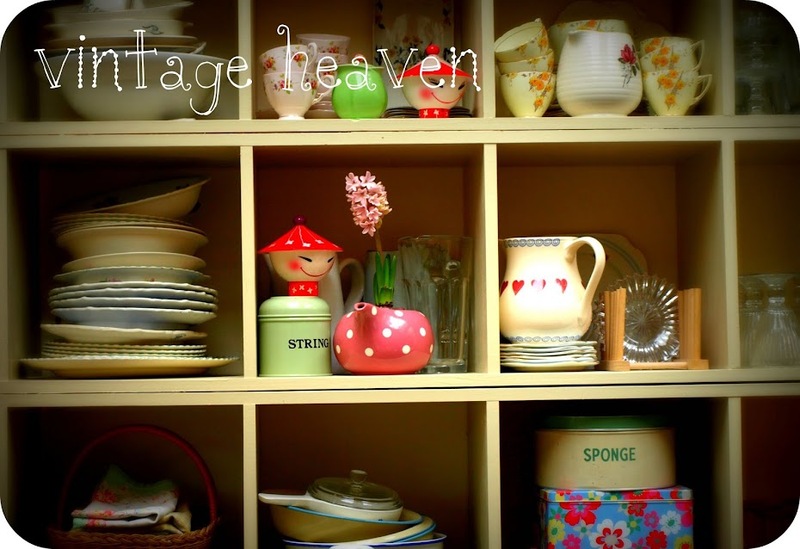 This is the top of my old kitchen dresser, filled with all my car boot/charity shop finds, apart from the little choir boy who belongs to Ian (one of the few ornaments he will lay claim to). 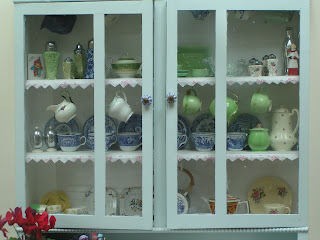 And finally my sideboard full of gorgeous old plates and serving dishes, and yes that is the sun you can see shining through, it finally came out this afternoon! 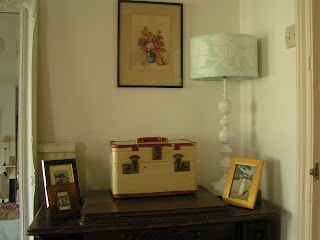 My mum spotted this old table in a junk shop, it was painted a dark green. 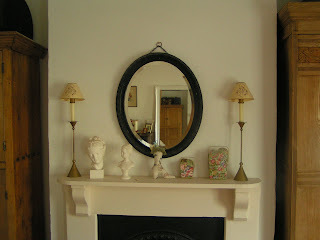 A couple of coats of Farrow and Ball "String" and it fits in perfectly I think. It's one of my favourite pieces of furniture and so useful, it can hold loads, a very important requirement in the house of an unrepentant hoarder! Come on everybody, cleanse those dirty minds. I'm talking about a new post. It's nearly midnight, my eyebags are the size of suitcases, my back's hurting from sitting at the computer and my vision's gone blurry - too long gazing at other peoples' blogs methinks! Ian has become a blog widower, poor bloke, maybe it'll persuade him to buy me a laptop so at least he can look at other people's houses with me - unlikely! 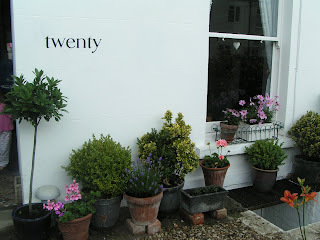 This is the front of our house, I suppose the number painted on is a bit of a giveaway there! It's funny but people know our house from that painted number. It's something I copied from the big, posh townhouses round here, and when I tell people where we live they often mention the painted number and how much they like it. 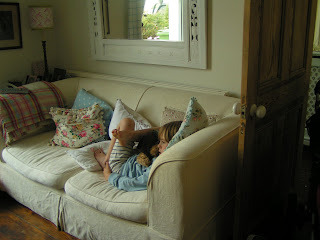 You can just see Kitty's pyjama'd legs in the doorway, she was wondering why I was taking photos. One of her favourite questions is "What you doin' Mummy?" with a sound of bewilderment in her voice! 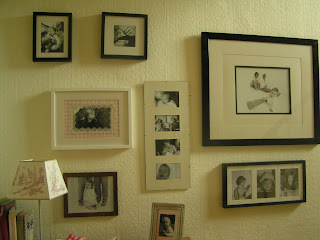 This is one of my favourite spots in the house, it's our little family gallery on the stairs. Before I go to bed each night and every morning when I get up these are the things I see. Most of them are simply blown up on ordinary printer paper from the computer and framed. I love black and white prints, so much more flattering and kind as the years advance I think! The hall in our house was painted bottle green when we moved in, it was so dark the removal men kept bumping into one another! 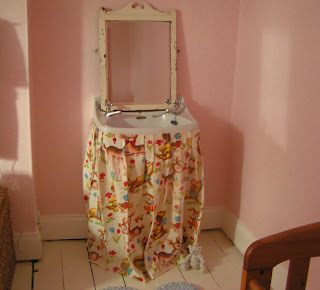 It's also covered in textured wallpaper that I would love to get rid of, but finances do not allow that so I'll make do with camouflaging it with family pics. 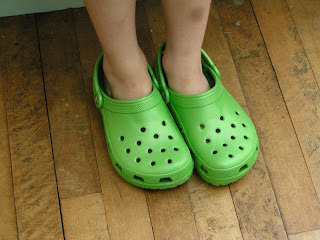 Finally, I know, I know, I've been sucked into the croc trap (these are Jack's), but I have to admit we love them! They are so comfortable and I have the excuse that we've bought them for camping. No more standing in other peoples' hair in the showers, and they are great for the garden, beach etc. That's my excuse and I'm sticking to it! 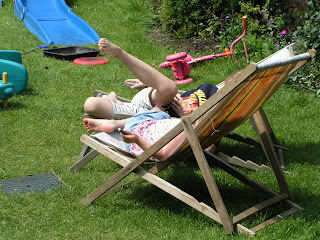 So how come I do all the hard work and these two get the deckchairs? Something's gone wrong somewhere! 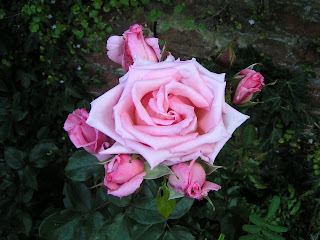 I'm so excited, we finally have a nice rose in our garden. When we moved in this rose was covered in blackspot and had about three leaves so last year I hacked it down to the ground and a miracle has happened. 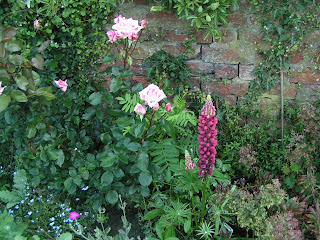 It's come back so healthily and the roses are a much prettier pink than before, I love it! Finally the garden seems to be taking off a bit. The children and I spent all day yesterday out there, them in the paddling pool and me grafting away, and I have to say it's starting to look pretty good. It's not a big space, about 50' by 20' and half of it is filled with climbing frames, scooters and various bits of "works in progress" (ie. tat), but it's enough for me. I have fantasies (hold on!) that I'd love to have acres of garden but in reality I'd never have time to dedicate to it and it'd just be another thing to get stressed about! 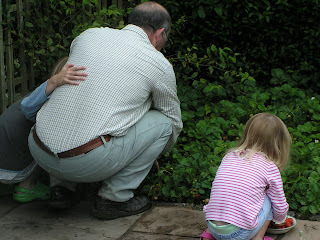 I have lots of ideas for my perfect garden but that will come when the children are older, for now we share it and they love it out there, although I think they preferred it as a building site when they could dig wherever they liked! Jack has his own little bit planted with delphiniums, stocks a clematis and the obligatory sunflower and he now loves "Gardeners World" - what have we done to him? It's been a fantastic weekend. 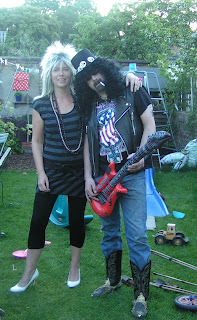 On Saturday I had a whole day child-free - yes, a WHOLE day! Andrea and I went to the open studios day in Stroud where artists open their houses for the weekend to the general public. The sun shone all day, we went to Nailsworth for lunch and a bit of shopping and then we wandered around the most amazing houses in the most amazing places all day. You know when you just love every minute of a day, we were like two schoolkids, I think the lack of children made us a bit giddy! 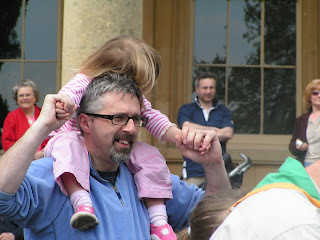 Ian looked after the children all day and when I got back they were bathed and in bed - BLISS! It was something Andrea and I both needed, and my batteries are recharged, I'm inspired to create, now all I need is a studio - hmmmm! Couldn't take any photos of the houses as I felt a bit awkward asking so the only one I got is of where we had lunch, and it's not a good one at that - never mind! 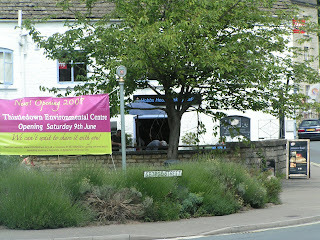 For some unknown reason, blogger has gone completely haywire tonight - has anyone else out there had problems? 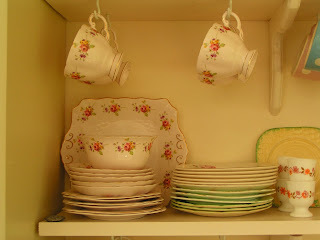 This is my favourite tea set. It was given to us by Ian's mum. 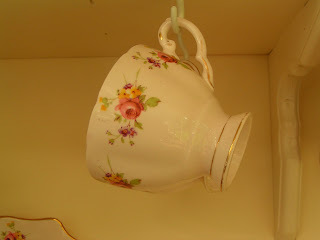 I just love the little pink roses and tea does taste gorgeous when it's in a china teacup. The problem is I'm a true northern girl at heart and I like a good mug of tea, so the tea set doesn't get used very often. I am a total tea addict, completely horrible unless I have at least two cups of tea first thing. During the day I "treat" myself to cups when I think I've achieved certain things, it cheers me up and quite often calms me down. I love it! 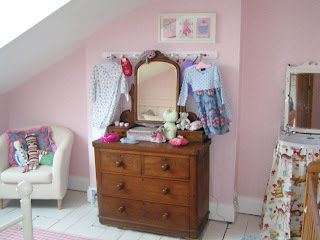 Another vision of pinkness in this house is Kitty's bedroom, although she professes her favourite colour to be "lellow"- she's not allowed an opinion on home decoration yet, she's not even three! Both she and Jack share the top floor of the house and it's lovely and cosy up there tucked into the eaves with great views of the hills over the rooftops. It's a great place for hiding all the paraphenalia that children accumulate. The mirror above was a car boot bargain that I haven't yet got around to hanging, I can't quite bring myself to drill into the wallpaper! Hope you're all having a great week, and here's to a sunny and relaxing weekend! ...........actually it's how it looks all the time until I sweep it all to one side to take a blog photo, just to convince you I live in a pristine palace! Is it just me or do we all spend a vast majority of the time picking things up and putting them away just to turn round to find them back in the same spot again. I also can't throw anything away, hence I have drawers full of bits of broken toys and party bag stuff that I hang onto "just in case". Jack wasn't well for a couple of days over half term so spent it like this, watching his favourite "Tom & Jerry" dvd on a continuous loop. 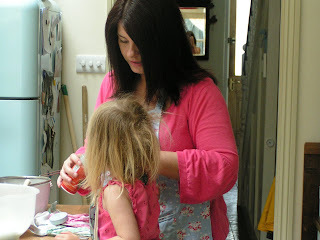 This is my sister Sarah helping Kitty bake a cake during her stay over half term, looking a bit like Nigella I think! She came to stay for a few days with my niece Hannah who I've threatened to put on the blog but my life's too important to me to take the risk! That's teenagers for you! I must also mention Sarah's partner Keegan who hasn't been mentioned yet, just so he doesn't feel left out. I know my sister will be reading this so love and kisses to Matt to wish him all the best for his GCSEs. It's always sad when she leaves after a few days stay, we live over two hours apart and I wish she was just around the corner. 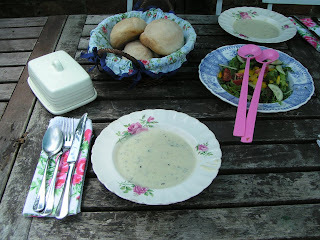 Finally the sun came out at the weekend and we could eat in the garden. 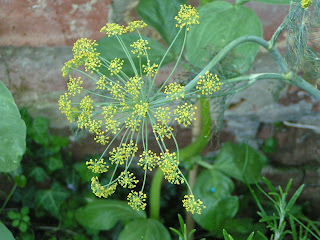 I made a really tasty (if calorie laden) celery and Stilton soup and we soaked up some rays. 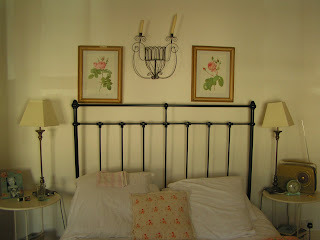 This is our bedroom, the one room I try to keep free from Lego, dolls' prams, K'Nex etc. 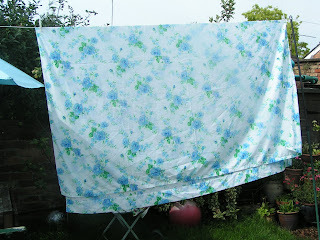 It is however home to an ever increasing pile of washing to put away. Once the pile gets to shoulder height I put it away and start again on the next tower. Now I should really go and do some tidying. 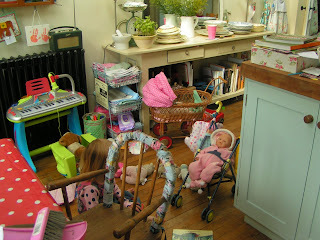 Tomorrow one of my oldest friends and her two children are coming to stay and as usual the house looks a little (understatement) untidy. 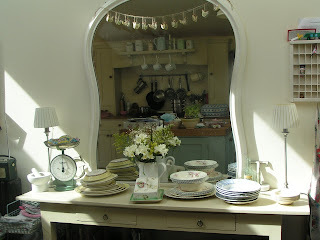 By the way to see a perfect house you must visit sophie, her house is a vision of gorgeousness and soooooo tidy!